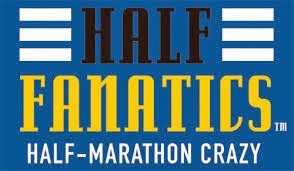 After getting a good rest on Friday night, Matthew and I woke up at 2:30 on Saturday morning to head to the half marathon. We were on one of the first buses over to Epcot; Matthew had all his gear, I was equipped with multiple spectator signs and my winter coat. Yes, it was another freezing and windy morning in central Florida. After meeting up with our peeps- and getting to see Matt aka Hokeyboy and his wife Kim- Matthew and I said our goodbyes as he headed back to the corrals. Luckily, I've spectated races at Disney before so I knew roughly when I needed to head over to the monorail to get a good spot at the Magic Kingdom. One of the benefits of not running this race was that I was able to see all of my running friends- those that came early and those that were rushing in at the last minute. I was so happy to finally meet Kathleen and Lee in person- we've been twitter friends for a long time and I've loved following both of their journeys to Dopey. I also got to meet Natalie and Jimmy, quite possibly the most good-looking and sweetest couple I've ever met. Seriously- they're awesome. And we met up with Andrea- whom I first met in-person last year on marathon morning, on the bus to the race start. Heather and her crazy awesome mother were there too- we have the best friends around. My camera sucked all weekend until I figured out how to balance out the whiteness. My bad. Me, Hokeyboy, Matthew, Kim, and Coach Jeff. Thanks to Matt for this picture. Around five, I headed toward the monorail. 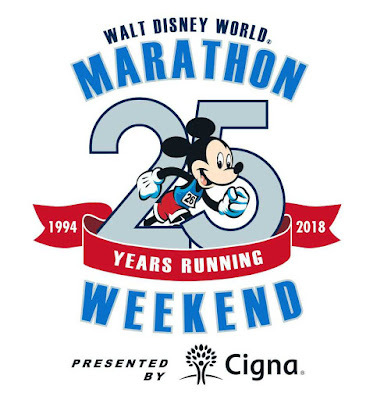 The first corral would start at 5:30 and the first runner would get to MK around six. The wheelchairs would be there within 15 minutes of the start. So I knew I had to hustle if I wanted a good spot. Back in the day, before I was a distance runner, I would watch Matthew run these races at Disney. In case you didn't know, I'm a professional spectator :-) I have a spot in MK, just before the runners take a right and turn into Tommorowland, that is just perfect for spectating. Here's why: they block off only half of Main Street, USA for the runners which means that it is incredibly congested during that part. However, when they are about to turn into Tomorrowland, the path widens and swings out to the left, just in front of the castle. That way, I'm sure to be seen and runners can safely hug the left side and come over to say hi to me without impeding the flow of traffic. But you've got to be there early and you've got to be ready to claim your spot. Big shout out to Mandy for grabbing this great shot! A quick ride on the monorail and I was in MK. As I entered the park, I was moved to tears. Full on, sobbing tears. It was beautiful. Seeing the castle lit up, with the huge Christmas tree in the foreground- it was just emotional. I think part of it was sadness that I wasn't able to run. 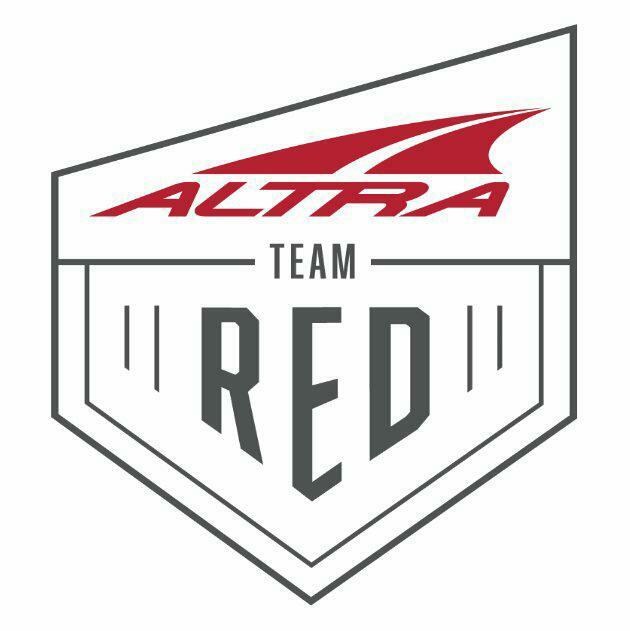 It is still tough watching from the sidelines, longing to be part of the race. Anyway, I found my spot and quickly got my signs ready. I was tracking multiple friends so I would be ready when they were close to me. I was also texting with Lauren, who was spectating from her resort around mile seven. I missed Coach Jeff and Patrick but did get a quick shot of Nathan as he flew by. I was able to see my friend Donna (who I first met through Instagram and then in person at the Divas VA Race), Mandy (twitter friend who I met in person at the Runner's World Half), Carlee, Krissy, and Megan (all twitter/IG peeps) and I even saw Bart Yasso! I yelled for him and he waved! I'm pretty sure this means we are BFFs now. As I was cheering, I looked over and there was Kim, Matt's (Hokeyboy) wife! She is probably my spectating idol- she takes phenomenal pictures and captures such cool moments. We chatted for a few minutes and then Matthew texted that he was on his way. He looked GREAT at mile five! We chatted for a minute, I got a few pictures, and then I sent him on his way. I had some time- I was expecting him to run a 2:30- so I stayed for a while and cheered for more runners. Then I meandered down Main Street and back to the monorail to Epcot so I could see Matthew finish. Seriously?! How awesome are these pictures?! Kim is AMAZING! Thank you, Kim! So happy to see my runner! 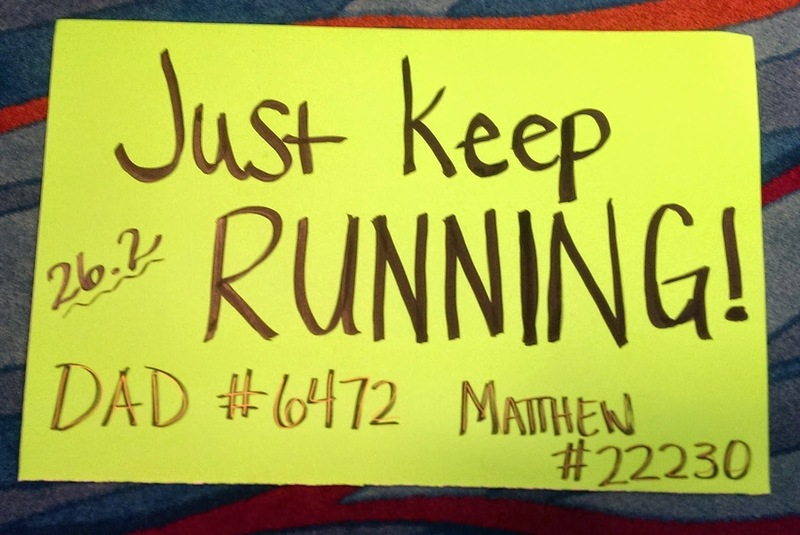 As I'm getting off the monorail, Matthew called me- he was at mile 13 already! Natalie and Jimmy had caught up to him at mile eight and paced him to the finish. I was so upset- there was no way I'd make it in time to see him finish. And the winner for the worst girlfriend/spectator of the year goes to... Ugh. Luckily, Matthew was totally cool with it and met me right outside the bag check area. He had actually finished somewhere around 2:16, a full 15 minutes before I was expecting him! He flew through those last few miles! As we were grabbing some pictures and talking about how he totally ROCKED the half, our friend Justin spotted us and said hello. 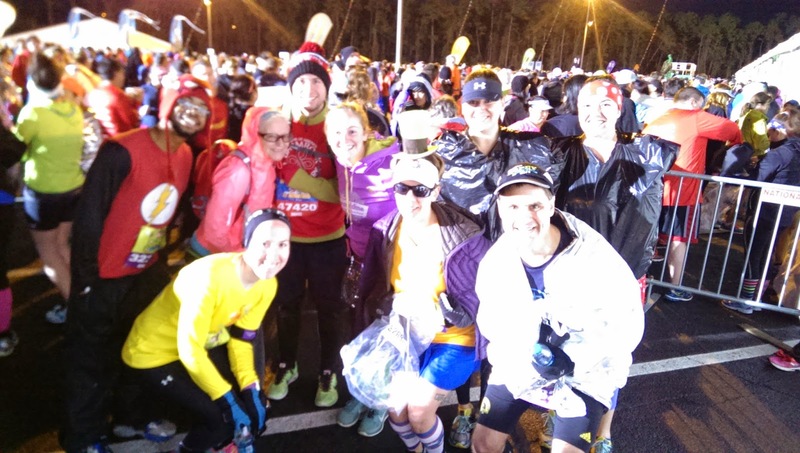 I cannot express how much we love runDisney events for this reason; we are surrounded by so many friends and so much love. 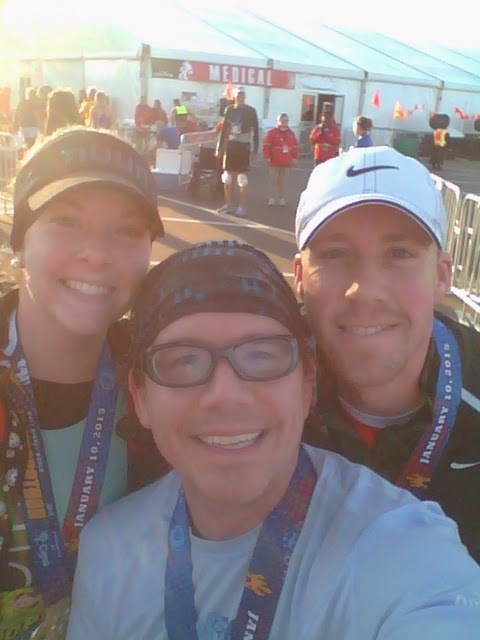 Finisher selfie with Natalie and Jimmy! Halfway through his fifth Goofy Challenge. 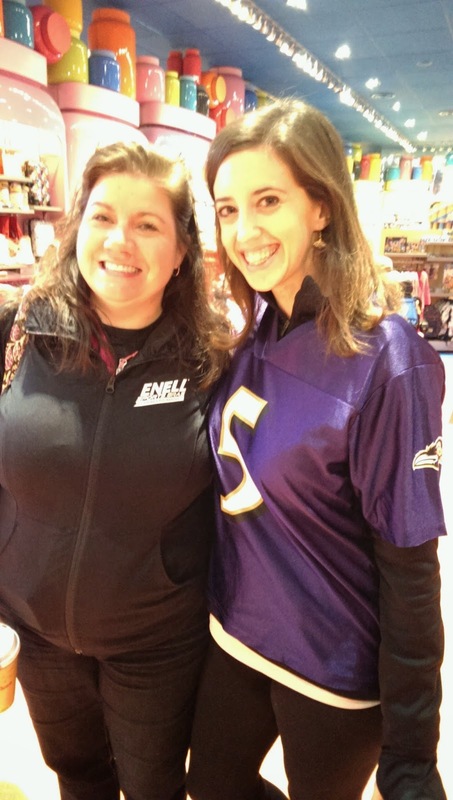 Team Enell in full force. At the expo, Jeff and I walked around, got our feet taped up at the KT Tape booth and ran into Lauren and her husband Mark! 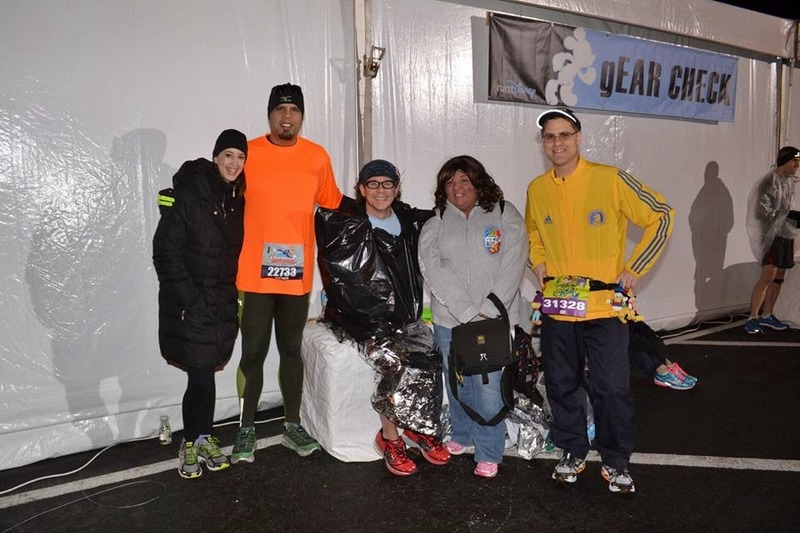 We chatted for a while and made plans to meet up the next morning for the marathon. 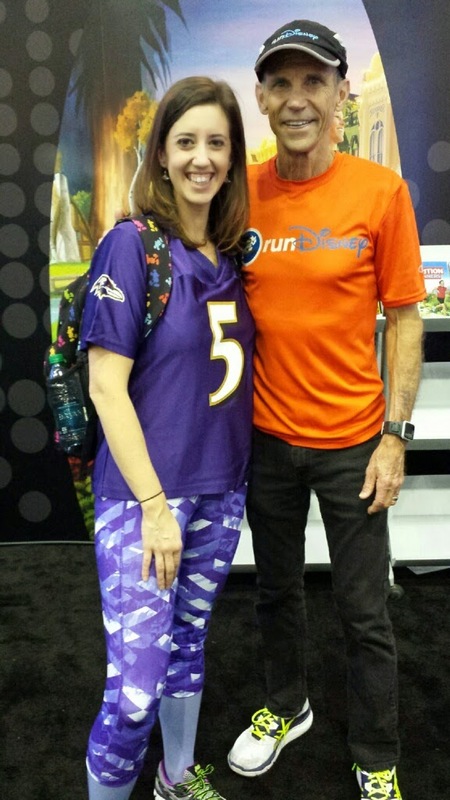 I also bought a great running jacket at One More Mile and got another picture with Jeff Galloway- I just can't resist talking to him when I can; he's such a cool guy. Jeff! Sidenote, only at a race expo is it appropriate for me to dress like that. We climbed into bed around nine, nervous with energy for what the next day would hold for Matthew and my Dad. 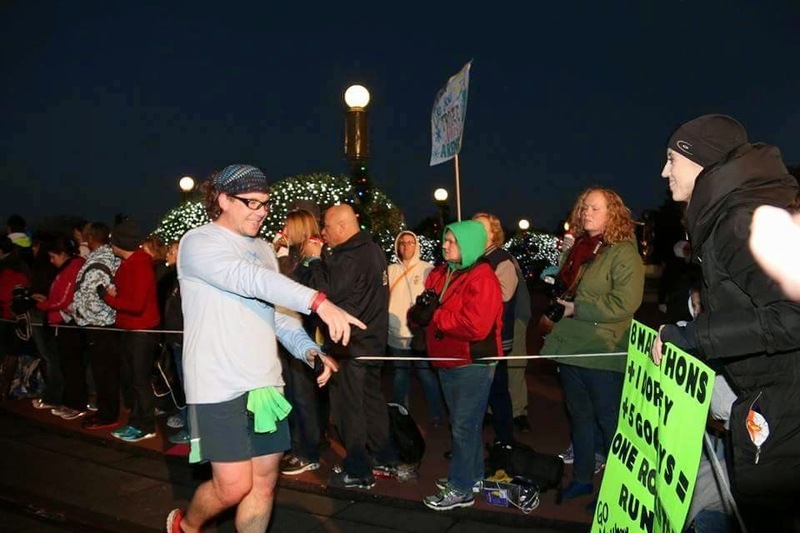 My 58 year old dad was about to be a marathoner. 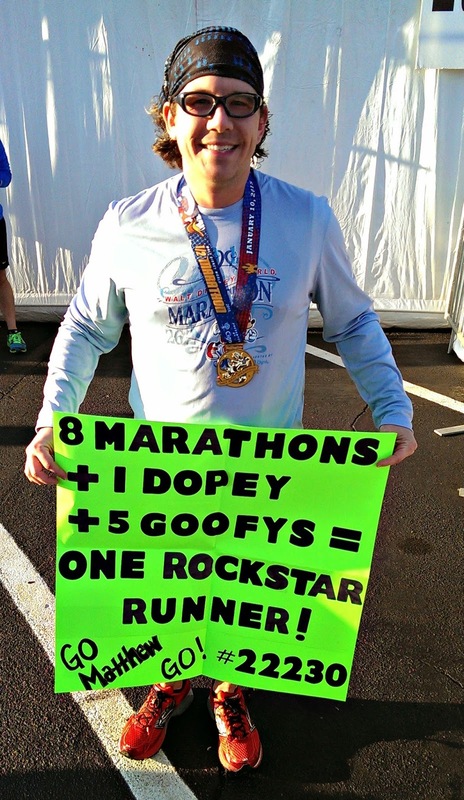 And Matthew was about to be an 8-time marathoner. I was so excited, it took a long time for me to finally fall asleep. 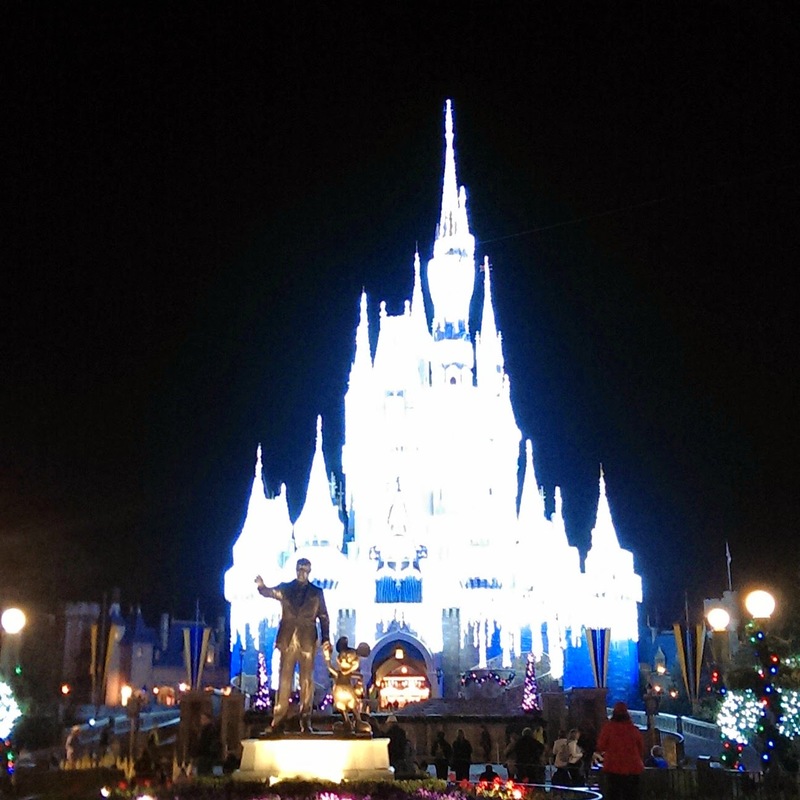 I just couldn't wait to see all the Disney magic that would unfold the next day. 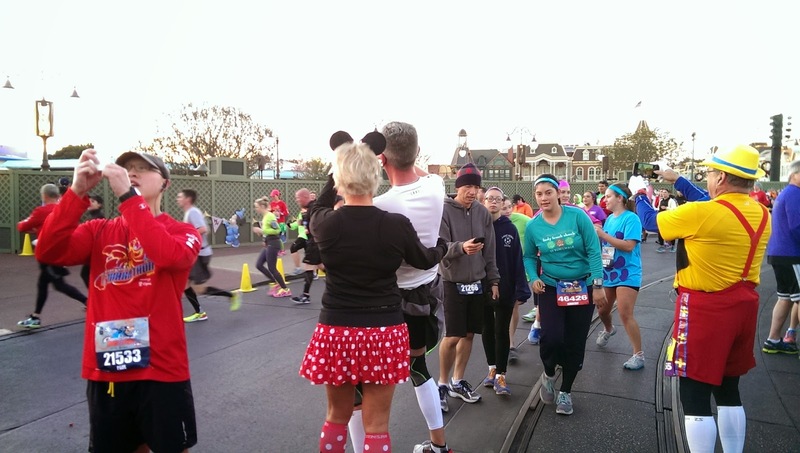 Hey Sarah...It's been so fun reading your Disney World race recaps. I feel like I get to relive that amazing weekend all over again. It dawned on me when I saw this post with the "Just Keep Running" sign that I had seen that before. I went through my pictures today and that's when I saw it. 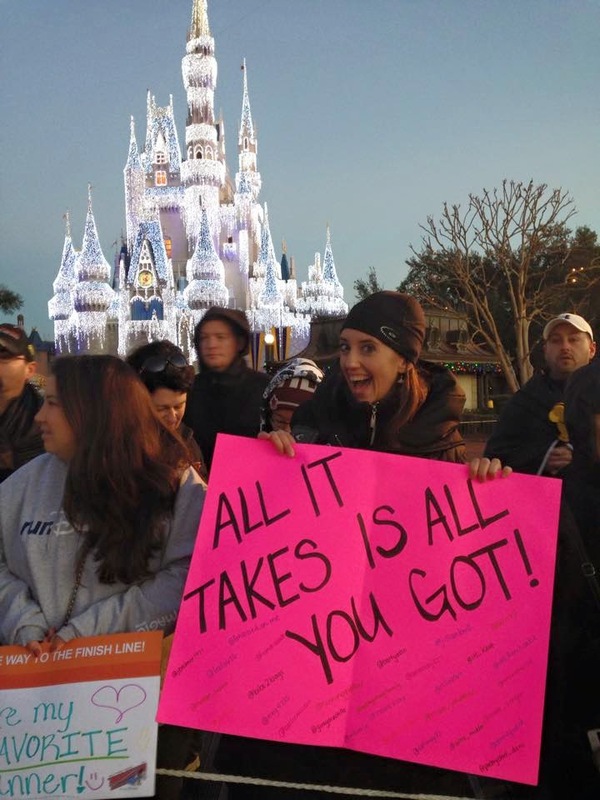 I took a selfie in front of the castle during the marathon and sure enough, there you are with that sign. So though we never got to meet we still have a photo together. And then shortly after this is when I met your dad and Matthew. Crazy...I need to figure out how to share this photo with you. Let me know what would work best. How fun!!!! 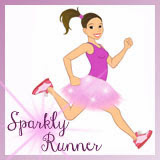 Please send it to me via email: sarah@sparklyrunner.com. 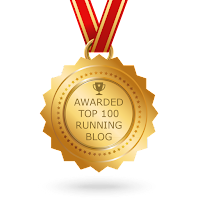 And half the fun of writing race recaps is reliving the day all over again :-) Congratulations again! 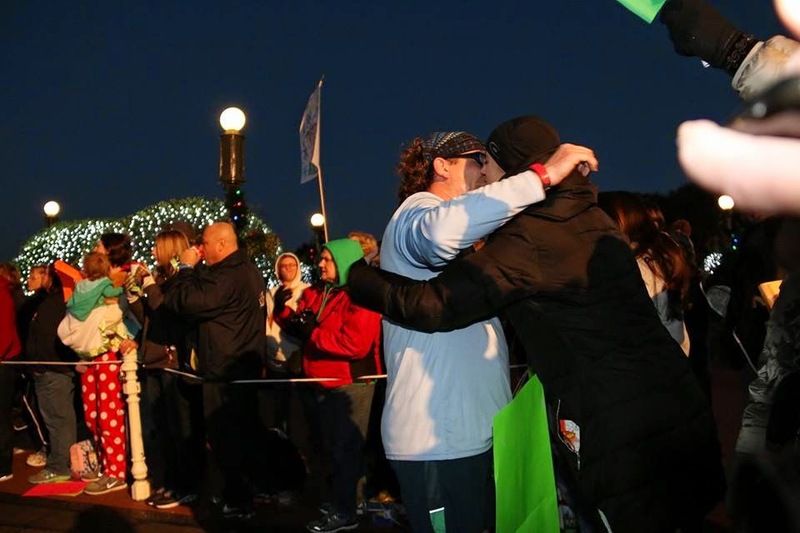 I hope you are still basking in the glory of being a marathoner! Running into you really helped me..I was so nervous and you and Matthew were great at the pep talk. Thanks for the shout out, its so much fun meeting bloggers you follow IRL. You and Matthew are adorable and my Sarah is still talking about you guys!